The last five years have been the worst for listed central public sectors enterprises in 15 years. Why no bankruptcy procedure for bleeding govt-owned enterprises? Public sector companies also continue to struggle with poor revenue growth. Combined revenues of non-oil PSUs will post a compounded annual growth rate (CAGR) of 2.7 per cent between FY14 and FY19 (nine months annualised), down from 11.6 per cent annualised growth during FY09-FY14 and 17.2 per cent annualised growth during FY04-FY09. The combined revenue for all listed central PSUs, including energy companies, is likely to grow at a CAGR of 1.7 per cent in the last five years as against 12.2 per cent CAGR during under the United Progressive Alliance’s second-term and 18.3 per cent CAGR during the UPA’s first term. The analysis is based on annual financials of a constant sample of 44 listed PSUs across sectors. Some of the key PSUs in the sample include State Bank of India, Bank of Baroda, NTPC, Bharat Heavy Electricals, and Power Grid Corporation. 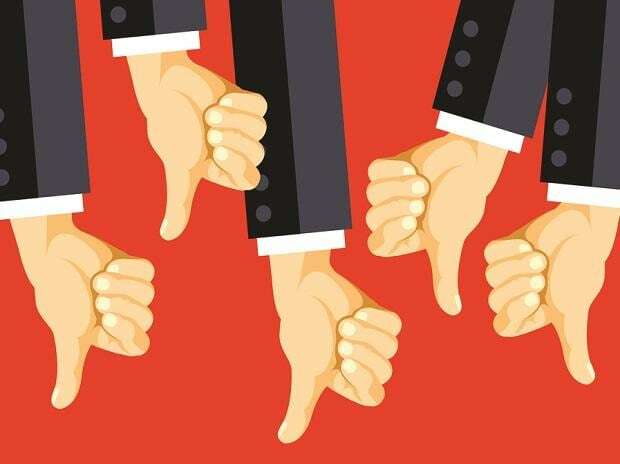 Experts attribute the poor show of PSUs to a combination of the industrial slowdown, lack of growth capital and companies’ inflexible cost structure, some of which has come to the fore in the past five years. “The industrial slowdown in recent years took a bigger toll on government-owned companies as they were not able to control their costs, especially salary and wage bill unlike their private-sector peers,” says Madan Sabnavis, chief economist, CARE Ratings. Oil companies such as Indian Oil, Bharat Petroleum and Oil and Natural Gas Corporation did relatively better in the last five years, thanks to lower crude oil prices in the international market. Others point finger at the poor capacity utilisation at government-owned firms. “Many PSUs had invested large sums in capacity expansion during the boom years of 2003-08 but demand slowdown in the last few years has resulted in below par utilisation in sectors such as power, capital goods and metal and mining hitting the profitability of PSUs,” says Dhananjay Sinha, head of research, Emkay Global Financial Services. He also flags the issue of a general lack of growth capital for government-owned companies. 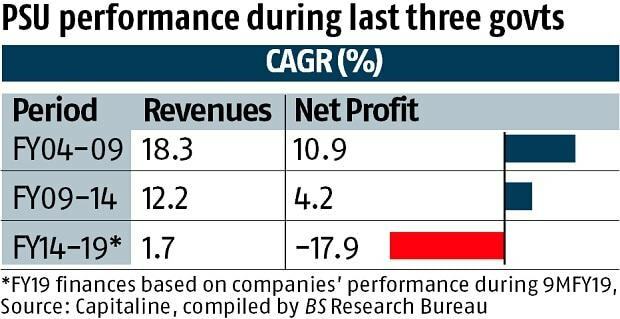 “The central government has repeatedly tapped PSU balance sheet to fill holes in public finance by way of dividends and share buybacks, leaving little retained earning with companies. This has restricted companies’ ability to invest in new growth areas and stay profitable,” says Sinha. Experts say that the lack of capital is the biggest issue for public sector banks forcing many of them to trim lending, compounding their losses. 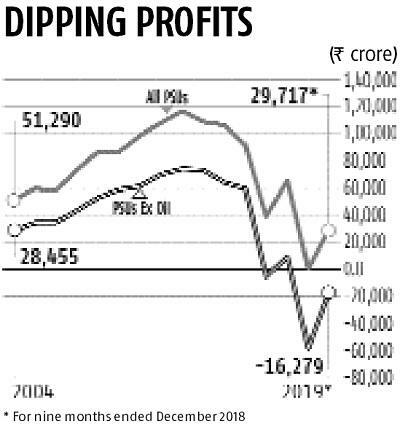 “If public sector banks had not stopped lending due to lack of capital, their losses would have been much lower and quite a few of them would have remained profitable,” adds Sinha. Poor show by PSUs has a negative implication for government finances as well. "Dividend from PSUs has been an important source of non-tax revenues for the central government, which has nearly dried up and is now hitting the overall public finance," says Sabnavis. Most experts don’t see an immediate turnaround in PSU finances. “It will take at least two years of strong growth in the industrial sector and a surge in investment rate in the economy to pull government-owned companies from their current slump,” says G Chokkalingam, MD and founder Equinomics Research & Advisory Services.